The Lady Luck Casino, there are 28 tables and 600 slot, keno and video poker machines. 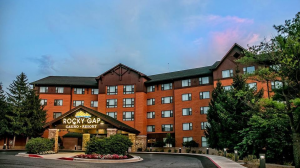 The Rocky Gap Casino Resort has over 600 slot machines from penny slots to $25 games. Come and spend four hours at each casino and try your luck. *** Please be advised that valid I.D. is required in order to receive casino bonus. Bonus subject to change without notice.